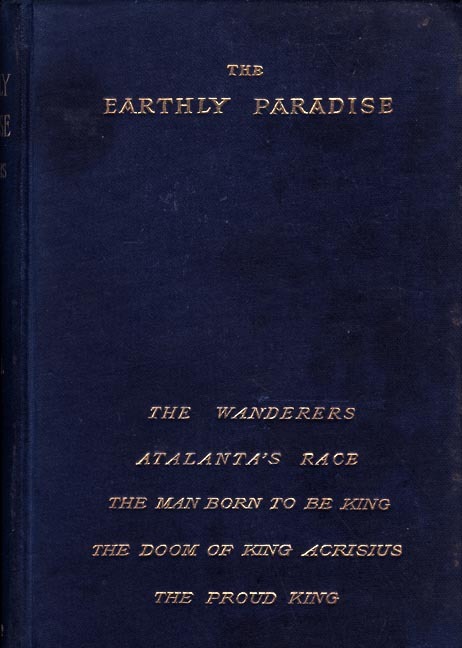 [George P. Landow scanned and converted to html the following text from the five-volume 1896 edition of The Earthly Paradise. Page breaks have been included as following to allow readers either to cite the original volume or check this text against it more easily: [218/219]. This text may be used without permission for any educational or scholarly purpose. A MAN of Cyprus, a Sculptor named Pygmalion, made an Image of a Woman, fairer than any that had yet been seen, and in the end came to love his own handiwork as though it had been alive: wherefore, praying to Venus for help, he obtained his end, for she made the Image alive indeed, and a Woman, and Pygmalion wedded her. Which man our old books call Pygmalion. But walked abroad with downcast brooding face. His once-loved life grown idle, poor, and vain. As still from name to name his swift thought passed. Diana's shaft, or Pallas' olive-stem? Until with shadowy things he came to live? And so it was with this Pygmalion. "O lady Venus, make this presage good! Shall bide within thy quivering myrtle-shade." That all was wrought so wonderfully well. A strange and strong desire he could not name. He came before the wondrous stone to stand. Then vexed he grew, and knowing not his heart. Whose chips this month a drachma had outweighed? The Theban will be good to me at need." Within the woods to work out his intent. The glittering noisy poplar leaves did play. Or murmured in the clover flowers below. But he with bowed-down head failed not to go. No restÑwhat do I midst this stir and noise? What part have I in these unthinking joys?" His hand was on the latch of his own door. "Alas! what should I do if she were gone? " In turn great pallor on his face did fall. That whitened was by labour done before. And, weeping loud, about the image clung. Who wilt not speak one little word to me." As though of love unchanged for aye she dreamed. Then went their ways beneath his troubled frown. Not worthy e'en to touch her rippled hair. Then cast himself before her on the ground, . Though all his folly in his heart he knew. Fresh spoil of flowers his love to lay before. The odour of Arabian frankincense. The heavenly beauty that can ne'er pass by." Of lovers' sorrows and their tangled sin. But now for utter weariness must sleep. Still wet upon the pillow all around. Wherewith he blessed the day that showed it nigh. Unto his bed, and midst soft dreaming slept. About her glorious kindly deeds of old. And followed after as the goddess led. Mocked the noon sun that o'er the cloisters burned. In days when unto him it seemed most fair. Now just arising, brushed the myrtle-trees. Just showed the golden letters of her name. As though some door were opened suddenly. I needs must pray, 0 help me or I die! Even a dead man's feeble memory. Into a feeble flicker as before. Altar, and fire, and ivory limbs did shroud. No better day upon my life shall beam." Ah, I am sick, and would that I were dead!" Nor wished to move, or change his dreary mood. Made himself brave the eyes of men to meet. With eyes downcast beneath their lovers' frown. Amid such sights had vanished utterly. "Ah life, sweet life! the only godlike thing!" Nor ever reach again his loveless home. Yet soon, indeed, before his door-he stood. To those who faithfully thy throne have sought! That I thine happy slave henceforth may be?" There shot a pang of his old yearning pain. The lively image of his loved one. Dyed like the setting sun upon the corn. And lay thine hand this heaving breast upon! And feel the freshness of the evening breeze. And wrapped us both in such a cloud of bliss. "Ah, thou art wise to know what this may mean! The marvel of thine hands, the maid of stone." As in his arms his living love he pressed. "Wilt thou not speak, O love? why dost thou weep? This that thou boldest, but in dreamy sleep? A madman, kneeling to a thing of stone." Then cried aloud and said, "O mighty one! What joy with thee to look upon the sun." He stopped and said, "Ah, love, what meaneth this? Seest thou how tears still follow earthly bliss?" Then both her white arms round his neck she threw. And sobbing said, "O love, what hurteth me? Made pain and pleasure ever greater grow?" Unless the old tales He, it draweth near." But awful as this round white moon o'erhead. For thee, a well-prized gift, to-day I give." To murmur in some tongue unknown to man. And round her loins a glittering belt was bound. What these words mean, and still wilt wiser grow. "Therewith her raiment she put on from her. And on my mortal lips her lips did press. I love thee so, I think upon the end." Although they felt the rich year slipping by. That through the golden glimmering sea did pass. The Creator and His Creation in Burne-Jones's Pygmalion Series: "The Dream of Something that Never was"
Morris, William. Pygmalion and the Image in The Earthly Paradise. 5 vols. London, New York, and Bombay: Longman, Green, and Co.: 1896. II, 246-72.